Allergies and Alzheimer’s: Keeping Your Loved One Comfortable and Safe! Do you suffer from allergies? If so, you’re not alone. Millions of Americans, especially during spring, experience the watery eyes and runny noses that come with seasonal allergies. And, like many health conditions, allergic reactions can become even more debilitating as we age. Compound that with an individual struggling with a dementia, such as Alzheimer’s disease, and you can imagine the discomfort and anxiety it adds to an already challenging life. Even more so if they can’t articulate their discomfort to those who can help. Know what to look for. Is mom rubbing her eyes more than usual? Are dad’s eyes watery? Watery eyes, a runny nose or even a cough can be allergy related. It’s important to be observant to any and all physical changes. Be careful with medications. Resist the temptation to reach for the antihistamines. It’s important to check with your loved one’s physician before administering any drugs, even over-the-counter medications. Dr. Christopher Randolph with the American Academy of Allergy, Asthma and Immunology’s Asthma and Allergic Reactions in the Elderly Committee, warns caregivers that antihistamines can have dangerous potential side effects, including confusion, drowsiness and urine retention. This can cause an infection, such as a urinary tract infection, or may lead to accidents, such as a dangerous fall. Antihistamines can also have a dangerous interaction with drugs that your loved one may already be taking. Control your environment. While we can’t keep pollen from blowing outside, there are things you can do to safeguard your loved one and keep his or her environment as clean and free from allergens as possible. Check your weather forecast for pollen counts and overall allergy alerts before taking your loved one outdoors. Encourage mom or dad to wear sunglasses to minimize irritation to the eyes. Make sure mom’s air conditioner is regularly checked and that ducts and vents are clean. Air purifiers can be helpful to keep the air circulating and eliminate allergens. At Anthem Memory Care communities, our medical team and caregivers keep on top of all conditions that can impair the health and wellbeing of our residents. Therefore, we are well aware of the impact allergies can have on physical and emotional health. That’s why we urge caregivers of loved ones with dementia to be diligent. Don’t assume that the allergy will “take care of itself”. 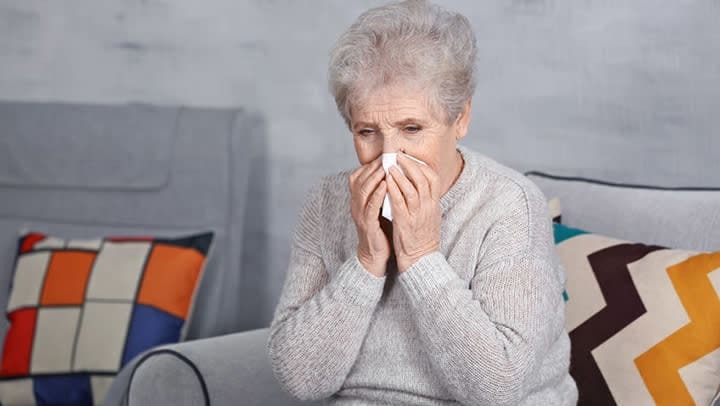 The symptoms of allergies can exacerbate existing health issues for older adults, especially those with Alzheimer’s disease and other dementias. Thankfully, for most allergies there are treatments that can help minimize the discomfort and improve the day to day quality of life for your loved one.